The Sunset House crime scene after the murder occurred. A MAN HAS been jailed for life by the non-jury Special Criminal Court after being found guilty of the murder of the manager of the Sunset House pub in Dublin. 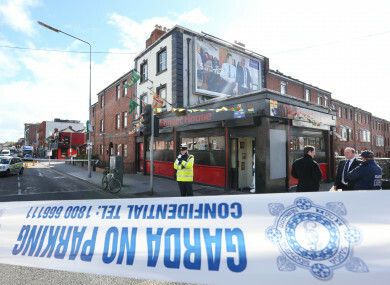 Eamonn Cumberton (30), of Mountjoy Street, Dublin 7, had denied the murder of 35-year-old Michael Barr in the Sunset House pub in Dublin’s north inner city on 25 April 2016. Barr was standing at the counter of the bar, socialising, when two men wearing ‘Freddy Krueger’ masks entered the pub and one of them shot him seven times, in what the court described today as a “deliberate” and “planned” execution. Mr Justice Tony Hunt, presiding, said that although the court could not determine which role Cumberton played in the shooting, he was one of three culprits seen dumping items connected with the killing into the getaway car. Earlier, the judge had said that the people socialising in the Sunset House pub that night were “treated to a very traumatic spectacle indeed”. At a press conference today, Assistant Commissioner Pat Leahy said that today’s verdict was “one part of a process that will go on and on” in relation to crimes connected to the ongoing Hutch-Kinahan feud. At 9.31pm on the night in question, two men had got out of a grey Audi, parked across the road from the Sunset House, and went into the pub. One of the men approached Michael Barr and shot him. The other man stood at the door and discharged one shot from a gun, which struck the bar. The men then left the pub and got back into the Audi, which was later found partially burnt-out on Walsh Road in Drumcondra. People in the area had seen three men attempting to set fire to the car. Gardaí arrived and extinguished the fire. In the car officers found three rubber masks, a baseball cap and four firearms. These items were “intimately connected with the killing”, Mr Justice Hunt said, describing the masks as “eye-catching, lurid and distinctive”. The judge said the court was satisfied that DNA found on the baseball cap and one of the rubber masks was Cumberton’s and that the three people seen outside the Audi were “involved intimately” in the events at Sunset House. He said that the items had been placed there in the car and that the men expected they would “soon be consumed by fire”. Mr Justice Hunt said the court was satisfied Cumberton’s DNA was found on items in the car which were “closely associated with the murder of Mr Barr” and that there was “no basis to conclude his DNA was present in car for some innocent reason”. Such a sequence of events would be highly improbable and a highly unfortunate coincidence for the accused. Michael Barr had been shot seven times, with five shots to the head and one each to the shoulder and neck. Ballistics evidence showed the shots had been fired from a firearm found in the Audi. While the defence had argued that the cap and mask might have been interfered with or contaminated, Mr Justice Hunt said the court did not find there was any such interference. The court had also heard evidence of Cumberton’s movements the day after the killing, when he attempted to board a flight to Thailand with another man. Mr Justice Hunt said that although it was not unusual for Irish people to travel to Thailand, the circumstances of Cumberton’s departure were “highly unusual”. Cumberton had booked a flight to Thailand at short notice, and gone to the airport with no luggage, but was prevented from boarding the flight because his passport was to expire within three months. The booking took place within one day either side of “this obviously planned killing”, Mr Justice Hunt said. Cumberton then applied for an emergency passport and travelled to Thailand the next day. He returned to Dublin on 25 May and was arrested on 27 May. During interviews, under a provision which allows a court to draw inferences from a suspected person’s failure or refusal to answer questions, Cumberton was asked to account for the presence of his DNA on the mask and baseball cap, but he remained silent. Mr Justice Hunt said that an explanation for the presence of his DNA on the items was “within his knowledge and a matter of speculation and conjecture for everybody else”. The court heard that Cumberton has 37 previous convictions. Prosecution counsel Ronan Kennedy BL read victim impact statements to the court. Noeleen Barr, the victim’s older sister, said that she and her brother were “were more like twins growing up” and that he also had a “younger brother and sister as well” who were “very close growing up”. Ms Barr said that “none of us expected what happened Michael” and that his death had “left a huge hole”. He was “a fun-loving father who doted on his children,” the court heard. She said that the “increased media attention has put further stress on the family”. Jade O’Shea, the victim’s partner, said that they had been “together over four and a half years” and were “engaged to be married”. She said that their daughter is “constantly asking about her father” but that they “will never get him back”. Sentencing Cumberton to life in prison, Mr Justice Hunt expressed sympathy and condolence for those left behind. He said that “gravity” of the shooting was seen by witnesses who were socialising for the night, “not expecting any of this to happen” but were “treated to a very traumatic spectacle indeed”. The judge also said that a child was present, describing the shooting as a “truly shocking crime”. Cumberton was jailed for life. Assistant Commissioner Leahy told a press conference today that An Garda Síochána is “sorry this [violence] is visited upon communities”. He said that while the gardaí had seen violence such as in this case previously, it was the “frequency of events” in the gang feud that took people by surprise. To date, 14 people have been killed in the feud since 2015. Leahy added that, in terms of efforts to tackle the upper ranks of these crime organisations, gardaí are, and would continue, making significant progress in this regard. He said: “There’s every effort to bring them to justice. We expect over time that will happen. We talk about dismantling this organisation and we will dismantle this organisation. There’s no other outcome conceivable in relation to this. Email “Man jailed for life over murder of manager of Sunset House pub”. Feedback on “Man jailed for life over murder of manager of Sunset House pub”.